When it comes to school uniform, my kids love to put it through its paces and push it to the limits of being tear and scuff resistant. They seem to think that uniform thoroughly enjoys being smothered in paint and mud and then washed on a daily basis. The truth is that because of this, I often buy supermarket brand school uniform so that when it comes to being replaced (trousers especially) it doesn't hurt my pocket too much and its affordable enough to replace on a fairly frequent basis. I was therefore delighted to be provided with the opportunity to test and review some of the Trutex range of school clothing and learn more about the brand. The company has been supplying quality clothing for over 150 years and are the leading brand in school uniform within the UK. 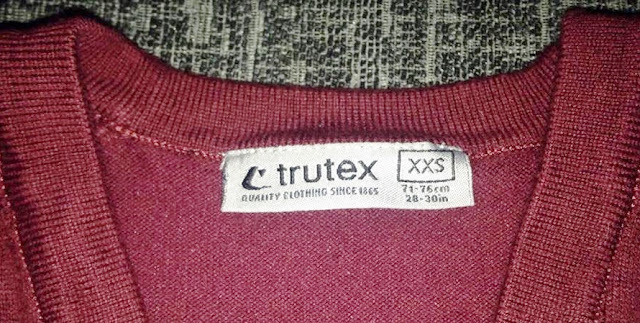 Trutex claim on their website that their uniform is made to last, and with such a statement to live up to, I couldn't wait to ask my daughter to put it to the test. The Trutex website provides a full catalogue of their clothing range, along with a store locator so that you are able to find your nearest stockist with ease. I was pleased to find that there were 10 stockists within a 15 mile radius of my home address and the address, contact number and distance was provided for each one. As you can see this is an extensive list, and each category features items in numerous sizes and colours so you can be sure to find something in the Trutex range that fits your school uniform needs. My daughter and I chose to test some Jogging Pants (Code JTP), Cotton Blend Cardigan (Code CAC), and Junior Girls Trousers (Code JGTB). My daughter wears both skirts and trousers throughout the year depending on the cold, so with the weather being poor at present we decided it would be the prime opportunity to test the trousers as opposed to a skirt. 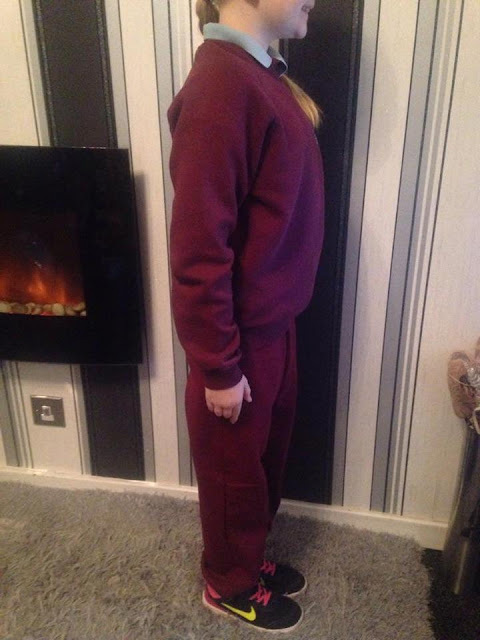 In my daughters school, jogging pants are part of the PE school uniform, however children are also allowed to wear them to school on cold days, or on PE/Swimming days to make getting changed quicker and easier. The jogging pants we received featured an elasticated waist and cuffed ankles, and also had pockets. They were suitable for washing on a 40 degree wash as well as being able to go in the tumble dryer. The fabric was made up of 65% polyester and 35% cotton and they had a lovely soft warm feel to them, which my daughter says was very comfortable. 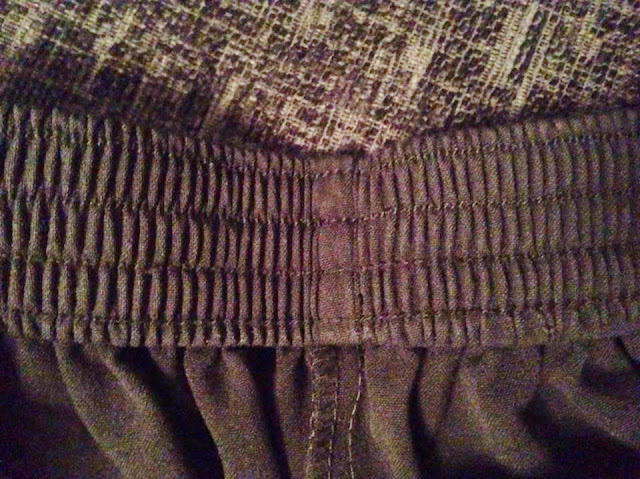 One thing that often annoys me about jogging pants and sweatshirts in particular is bobbling, however these jogging pants have a low bobble feature which should hopefully prevent that when being regularly washed. My daughter wore these to school on a couple of cold PE days and said that they were very comfortable, and that she was able to move freely in them without feeling any pulling or stretching around the waist. The cuffed ankles made them rest comfortably above her trainers and fitted snugly over her socks meaning no cold feet or ankles. The inside was very warm and soft and they were very easy to get on and off, making getting changed in school much easier and quicker. My daughter liked the fact that there were pockets as it meant that when she has to remove her earrings for P.E, that she could keep them in her pocket safe and somewhere where she would remember. 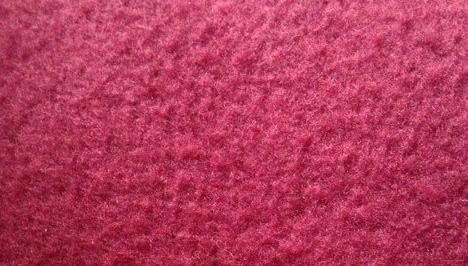 (Picture - The soft fleecy inner fabric). There is an inner draw cord, which my daughter hasn't needed to use yet, however as with any child size and weight can change quickly, so it is also beneficial to know that there is some adjustability in the jogging pants should she need it in the future. The joggers have so far been washed 3 times on a 40 degree wash and have been tumble dried twice and left hung to dry once. The fabric came up much softer after being in the tumble dryer so I shall continue to use this method of drying going forwards, as it made both the inner and outer material have a much nicer feel to it, than when it was hung to dry. There has been no fading to any parts of the jogging pants which I find can sometimes happen with supermarket brands, especially around the waistband and pocket areas. As I have only washed these three times so far, then I would not have expected any visible changes from any clothing product, but I have been impressed that the jogging pants have retained their soft and comfy feel and I shall update this post again in a months time to provide an update on washing and drying once they have reached at least 20 washes. In terms of the playground test, my daughter has fallen over twice already whilst wearing these. Both times were on muddy grass as opposed to concrete, but the mud was easily removed, and their was no damage to either of the knees which is always a good sign. I was very keen to try this particular product out, as I have always purchased the school branded cardigan in the past, but have found that after a few wears it has got quite baggy around the waist area which my daughter really doesn't like as it stops looking smart and becomes noticeable. 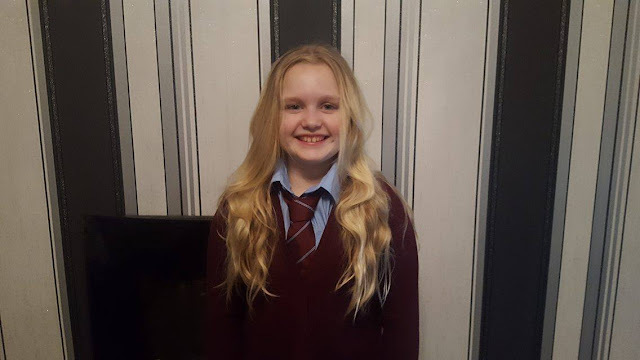 Therefore after going to school smart for a couple of weeks in her cardigan, shirt and tie at the beginning of the school year, she has usually switched back to her school sweatshirt by the time of October half term. Again this product had a nice soft feel to it, and immediately you could tell that it looked a great quality item. It was nicely fitted, so not too loose but also not too tight with a shirt and tie underneath. The buttons were easy to use and not too stiff and the arm length was perfect. Arm length is another annoyance of mine as this can vary so much between brands and I sometimes find that despite selecting the right size for my daughter, the sleeves can end up looking too short. The cardigan is made up of 39% cotton, 39% acrylic and 22% nylon and like the joggers it has a low bobble feature. and can go in both a forty degree wash and the tumble dryer. Since receiving this item the product has been washed on 4 occasions and it has retained its shape and colour well without any issues. There has been no shrinkage to the item, and despite several yoghurt and food spillages down the top, there has been no colour change or fading anywhere on the cardigan. There is also a nice shape and good quality stitching to the neck area. 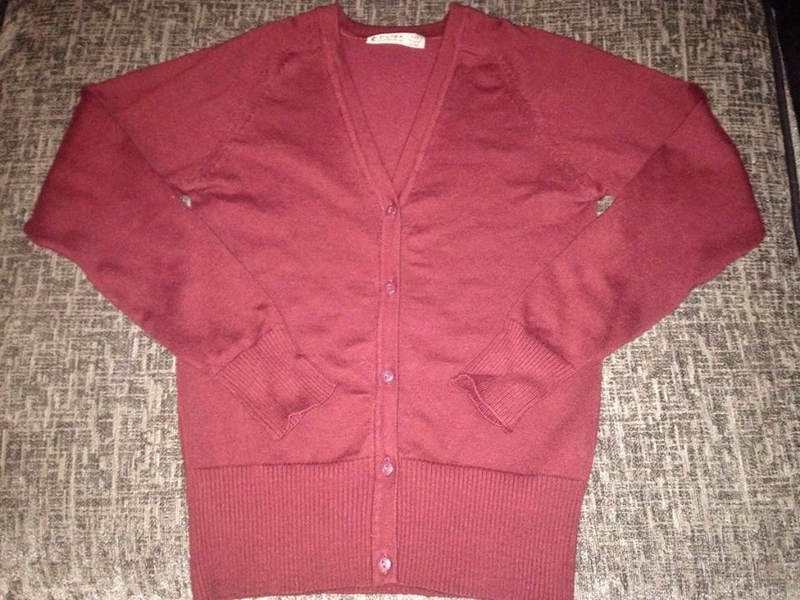 I thought that the cardigan was a nice length, and fitted nicely over trousers, covering the waist nicely and being long enough to hide any zips and buttons on trousers. This product was my favourite of the three and I felt that my daughter looked really smart wearing these together with the cardigan. The fitted nicely and there was also an elasticated back waist if you did need any flexibility with the sizing. The trouser legs had a pressed leg shape which sat nicely over her shoes and came down at just the right length. The fabric is made up of 63% Polyester, 33% Viscose and 4% Elastane and the stretch fit meant that my daughter felt really comfortable wearing them. She enjoys being active in the playground some days and often plays games with her friends, and so it is important to me that she is able to move around without any discomfort or feeling of tightness. Emma said that they fit really well and that she has been able to run around the playground without any issue and feels more relaxed wearing trousers as opposed to a skirt. In terms of wear, my daughter did have one bump on the playground whilst wearing them but there was no tear or damage to any of the fabric. She also caught them on part of the fencing at the school and despite them having a bit of a tug, there was no rip, much to my relief. The product has washed well, maintained its sizing and shape and they are very easy to iron. Anything which makes ironing less of a chore is a winner in my book and a much needed help. My daughter has received several compliments whilst wearing them, and one of her friends also asked where she had got them from. Overall, we have been very pleased with the quality of all three items. 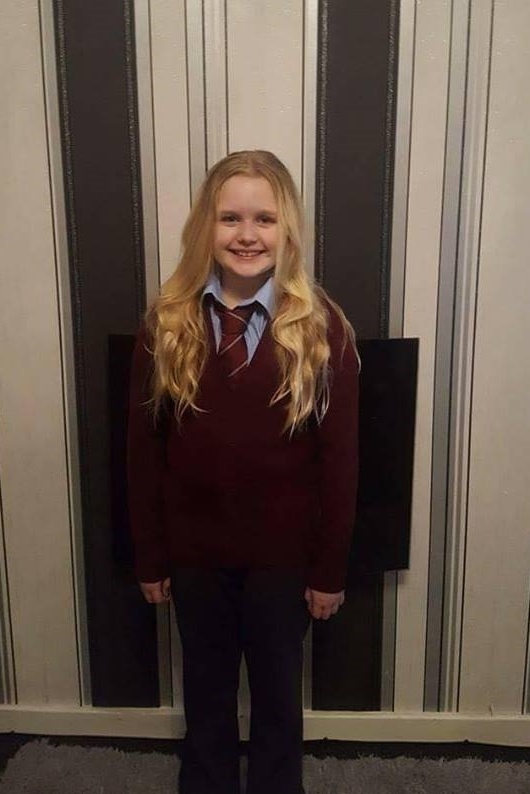 School uniform can go through so many things on a daily basis and it can become quite a chore having to repeatedly wash, clean, dry and iron items, or regularly have to replace them. As I mentioned previously, it is because of this reason that I usually purchase supermarket brands so that they are affordable to replace. However after experiencing the quality of these products so far, I have been very impressed and shall definitely be looking to purchase more of the Trutex brand for my other children too in the near future. 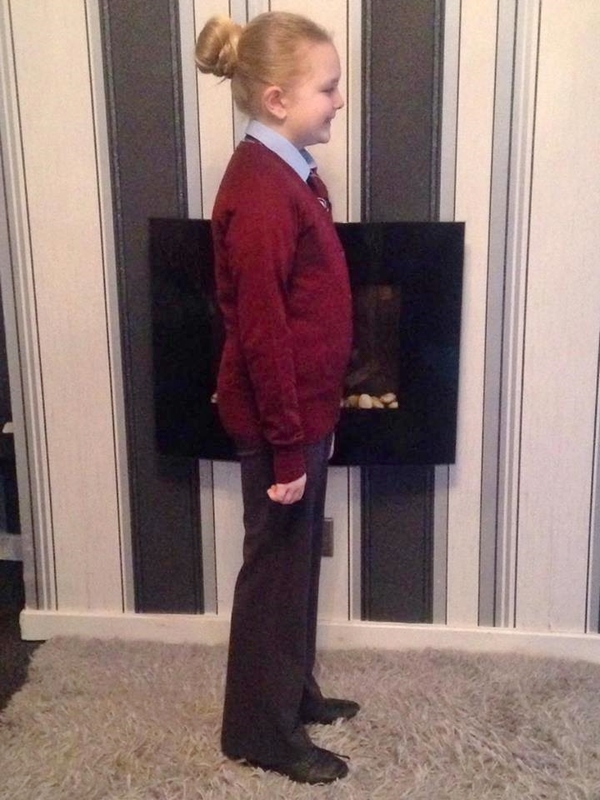 *Disclaimer - I was provided with 3 items of school uniform to test and review and provide an honest opinion of our experience with the products. All opinons are my own.